It seems like lately China has been really opening up and sending all sorts of movies our way state-side. I was never opposed to a good foreign flick before - foreign horror introduced me to all sorts of variations on creatures like the Hopping Vampire or takes on ghosts that were familiar but different, or even on actual events played up a bit more fantastically such as the Dyatlov Pass incident. Admittedly, sometimes my eyes are lazy and I just can’t find the mood to read a movie and I’ll stray away, and one could argue about the need to read subtitles drawing my eyes from the screen and potentially missing little details, but that’s where things come around today. Operation Red Sea is an action entry, and I’m chomping at the bit for some rock and ready battles. The plot here isn’t totally unfamiliar to the action-going movie watcher. Crack military team gets orders to do some missions, battles erupt, and body counts rise. 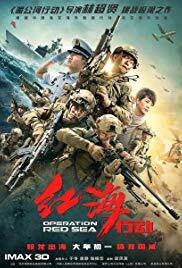 In this case, it’s a Chinese naval team, and they really have a breadth of response team actions throughout the movie. An initial pirate takeover of a cargo vessel leads to a hostage situation and a race to beat the escape from Chinese waters. After that, rescuing civilians from a coup quickly escalates from a passive endeavor to a focused rescue attempt when a cabinet of foreign affairs finds themselves pinned down. Without much of a break, things track sideways into the rescue of another Chinese citizen from terrorists supporting the coup, only to further escalate to a final confrontation of preventing said terrorists from getting their hands on a supply of and formula to making a whole lot of dirty bombs. It’s a good progression, not too fast thanks to the two hour run time, with moments that can feel a bit like padding. There’s a steady flicker between action and slower moments, and there’s not a whole lot to find at fault there. You could argue that there isn’t really a whole lot of development to the characters - which is something that many large-scale military style movies end up running into. They build out the cohesion of the unit to make them feel like pals as you would expect, and the group’s spotter does have a little bit of story advancement along the paths of soldering. Besides that, there’s a short burst of romance in there between two soldiers, but it never really ends up being “a thing” to say, and is primarily only used as an attempt at heart string tensions when the crap hits the fan and danger escalates. The movie carries the tag of “based on true events” - but given I have no knowledge of the events I can’t speak to how much of it is accurate or how much has been movie tinted. Still, the characters all feel believable, are incredibly not immortal, and both lend themselves to the tensions and drama of a war movie in that sense. The only real non-military character to get any real sort of focus is a reporter, who serves the story progression towards the end, and it’s through her we learn pretty much everything about the dirty bomb threat. She also has a nice little back story that’s thrust into the movie in one short dump to help bring a little humanity to an otherwise soldier following orders situation. When it comes to costumes, there is the slight issue of many military movies - with so many people wearing the same outfit, with the same builds and hairstyles, it can be a bit hard at a glance to distinguish any one character from another beyond noticing their weapon choice. The woman soldier stands out some thanks to her voice - and it is nice that their wasn’t any real forced obsession with her being a woman over a soldier, as sometimes movies do go that route and suffer for it - but beyond that it’s mostly looking at the weapons and some subtle changes in either facial features or gear loads. The snipers are always on their spotting scopes or looking down the rifle, making them easy to distinguish (and also largely are the only characters who really have an appreciable introduction when it comes to the unit), the comms guy has his radio pack and some tech gadgets, and the lady and her role comrade both have some machine guns to bring the support. In turn, their costumes do differ from that of the friendly forces, the civilians, and the terrorists - so you never are really lost as to who belongs to what during firefights and battles. The first of a few times we get some slow motion. Actors do a good job from what I can tell, at the very least in body language and facial expressions. There is an abundance of english lines being thrown about, which I take some annoyance with given that since it’s in english they don’t bother to place any subtitles on them. When the rest of the movie has them, it seems like an odd choice to not include those, especially given there was a few times when I couldn’t quite make out what a person said - but I hardly believe that it’s the actors fault there. Mostly just a volume thing. Although actors may not win any awards for best touching experience in movies to date, they play out the physicality and action side of things with much bravado and that much is appreciated. Effects are a real blast. If you expected Hollywood blockbuster, then it’s going to deliver. Explosions big and small, gun fire and impacts, carnage and tanks - it’s all floating about in here. Action scenes frequently are mixing the things, and the only thing missing that would convince you it was a Bay movie is the spinning camera during the slow motion shots. You could point out that some of the slow motion shots are a bit mediocre, serving more as a moment to slow down the high-paced action going on, or that the bullet doesn’t look particularly convincing during the slow motion shots, but at the very least it isn’t overused. In fact, the first usage of it is actually pretty nice, showing off a crack shot from the teams sniper and demonstrating just how crazy a shot it was to the viewer at a more appreciable speed to let it sink in. There are even a few burns in there, full body or otherwise. Plenty of stunt and effects work here to be sure. The violence levels do seem to swivel a few times, ranging from somewhat clean and precise shots to full blown Rambo meat-wagon grade “horror of war” moments. Perhaps a bit much for some folks, but it at it’s core at least isn’t just glorifying the violence taking place in that way. Audio is pretty tight for the most part. Occasionally, as previously mentioned, an english line was too quiet for me to pick up (exacerbated by the lack of subtitles during those lines). I can’t speak for inflections on the Chinese lines because I don’t speak it, but at the very least they are all quite audible for those who do. Gunfire and explosions also carry some enjoyment to them, without overloading you ears or blocking out things they wanted you to still here. There’s also some music in there, but as is the case for me in many movies it fades into the background as it does it’s roll of just adding to the events on screen. I just really like this shot. If you want a nice war-type action movie, this one’s a pretty good option. The trailer shows off whats on display pretty well, and as long as you don’t mind reading some subtitles it’s a good ride. Solid action scenes that aren’t too heavily edited into oblivion will keep you engaged, but you won’t be experiencing a golden age of character development. The true story angle can help ground the experience in respect for the soldiers actually involved, even if the events might have been built up or edited a bit for movie purposes. In the end, it’s another movie I’m happy to see make it’s way over the seas.